TRW Automotive Holdings (TRW) has unveiled its new Hybrid TPMS system. This next generation TPMS system merges the sensing technologies of today’s TPMS systems with automatic location functionality. Like the current generation TPMS sensors, this new Hybrid TPMS sensor uses four basic wheel-mounted direct TPMS sensors to measure the pressure and temperature of the air inside a tire. What the Hybrid system then does is combine the data gathered from the wheel-mounted direct TPMS sensors and combines it with the wheel speed data from a vehicles ABS or electronic stability control (ESC) system. What results is an auto-location function which informs the driver which tire(s) may have low pressure. 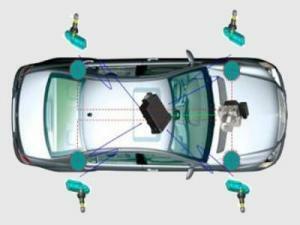 The combination of data from the TPMS sensors and the vehicle’s ABS/ESC sensors is sent to the Hybrid System Receiver mounted in the passenger compartment of the vehicle. – Housing and installation costs are reduced since the receiver is located inside the vehicle, therefore making the Hybrid TPMS System the most affordable auto-located system yet. TRW Automotive Holdings expects that its Hybrid TPMS System will be ready for production by 2013.